Fortune 500 CEOs Aren’t Social — Ummm…Thank You! 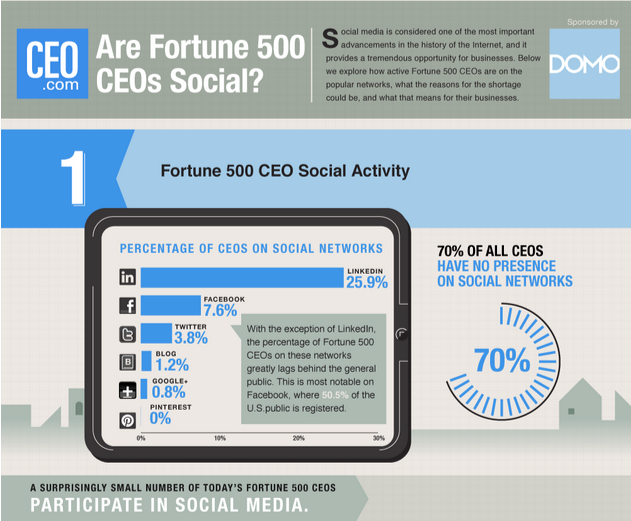 Home &gg; Blog &gg; Social Media &gg; Fortune 500 CEOs Aren’t Social — Ummm…Thank You! 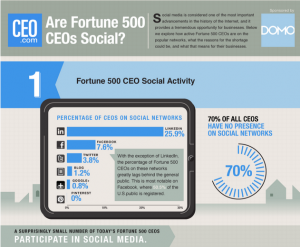 A new report debuted last week on CEO.com from the creators of DOMO, which citied findings about the social participation of Fortune 500 CEO’s. The report showcased the fact that only 7.6% of big company CEO’s are on Facebook; only 1.8% actually use Twitter; and that 70% of global CEO’s have no social media presence at all. To these numbers, I say…FANTASTIC! Now, don’t get me wrong…I’m a huge proponent of social media and of measuring it methodically…I even wrote a book on this topic. Further, I corroborate the statements that social media has become a transformative force that’s changed the way individuals and businesses communicate. Of course, without a doubt! Yet, when CEO’s are called to task for not individually participating in social channels…well I for one think that they should be spending their time focusing on fiscal responsibility, shareholder value, and customer satisfaction with their products and services. These CEO’s should be lauded for focusing on what matters and for delegating a social presence to others within their organizations who are hired to interact with consumers and to keep touch with the pulse of their marketplace. The downloadable report is accompanied by a slick video and jazzy infographic…that basically tell us that most CEO’s aren’t Twittering all day (Ummm…that’s good, right?). While this report certainly doesn’t shed light on what CEO’s actually do spend their days doing, it proves that they aren’t looking to social media as an output channel. And thank goodness for that. While social media is undeniably valuable for communicating to consumers, marketing to them, and interacting in meaningful ways…last time I checked, that’s not the job of an officer in chief. Do they need to be aware of it…? ABSOLUTELY! Do they need to be open to consumer and employee interactions? Why Yes! But do they need to be a first-line responder? I think not. There are lots of ways for executives to stay informed and to communicate. Yet, bolstering a social media presence only to abandon it shortly thereafter, or allow it to die a slow unused death doesn’t help anyone’s credibility. Maybe I’m alone, but in my opinion the underlying premise of this research missed the mark by a long-shot. Fortune 100 CEO’s shouldn’t be pandering to consumers on social media. Let’s allow the executives in chief the opportunity to focus on business and save the Twittering and Facebooking for the marketers. When you look at what companies make up the Fortune 500, many of them aren’t B2C companies; why would they be interested in hearing the comments of a single person/non-customer? What benefit does having energy company CEOs on Twitter? To take a nonstop barrage about how oil is bad? Or non-branch banks/financial like Berkshire Hathaway and TIAA-CREF? Like you, I’m glad most Fortune 500 CEOs have better things to do than Tweet (or, just have more discretion? ).